Sikkim invites the tourists with its lush green tropical forests, fascinating snow capped mountains, snaky streams as well as the richest flora and fauna of the region. It attracts the tourists with its many beautiful lakes, hill stations and wild life. There is much more than this in Sikkim like the historic monasteries and above all the hospitality of the Sikkim’s people. Sikkim is a beautiful paradise nested in the Himalayas. It conserves many examples of Tibetan architecture. 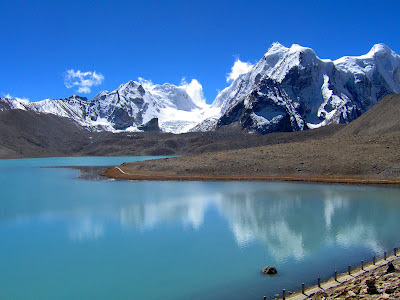 Sikkim situated in eastern Himalayas below the highest peak Mount Kanchenjunga the third highest mountain can be reached by air, rail and road. It is not having its own airport and the nearest airport to Sikkim is Bagdogra in West Bengal. It can be visited during the summer season before the winter starts. The best time to visit Sikkim is between the months of March to June. The incredible tourist places in Sikkim are grouped as monasteries, hill stations and other tourist attractions. Monasteries are the religious places adorned with Buddhistarchitecture and colorful buildings displaying the cultural heritage and lifestyle of the people of Sikkim. Lamas chanting the mantras at the background of the drums and trumpets are a regular scene of the monasteries. The more popular of them are Rumtek Monastery,Phensang Monastery, Pemayangtse Monastery and Tashiding Monastery. The major attraction of Sikkim and most popular hill station of Sikkim is Gangtok. The delightful and appealing beauty of the place has made it popular as the most favored hill station of North East. Sikkim is a garden city lying at the foothills of Himalayas with long boulevards enclosed in a bowl of colors. The blooming flowers with an exotic view lure the tourists. Other tourist attractions include Do-Drul Chorten, Sikkim Research Institute of Tibetology, and Jawaharlal Nehru Botanical Garden Located at an altitude of about 2200 meters. Visit this Himalayan state to explore the beauty of the inviting Himalayas. Sikkim in winter can be enjoyed by viewing the panoramic scenes of snow covered mountains, which is a lifetime experience for the nature lovers.